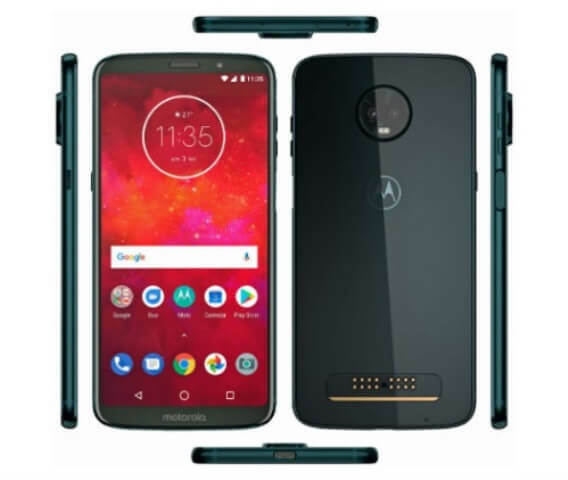 Home Moto Motorola News Smartphones Moto Z3 Play Launched; SD 636, 4GB RAM, and Dual A.I. Cameras! Moto Z3 Play Launched; SD 636, 4GB RAM, and Dual A.I. Cameras! It’s official! Motorola has unleashed its latest mid-range device – the Moto Z3 Play. The Moto Z3 Play is housed with a water repellent nano-coated 6000 series aluminum body, and as usual, it supports Moto Mods. The device flashes a 6-inch FHD+ Super AMOLED display with 2160 x 1080 pixels. It comes with Gorilla Glass protection, too. Under the hood, the phone packs 64-bit Snapdragon 626 chip with A.I. paired with Adreno 509 graphics. It can be coupled with 4GB of RAM, and 32GB or 64GB of internal storage, which expandable up to 2TB via microSD card. The handset comes with a dual-rear camera design, composed of 12-megapixel f/1.7 and 5-megapixel f/2.2 sensors. It sports A.I. photo features, including Cinemagraphs and Google Lens support. It boasts 8-megapixel f/2.0 selfie snapper, as well. Moreover, it is geared with 3000mAh battery with Turbo Charging tech. The Moto Z3 Play runs on Android 8.1 Oreo operating system. It will be available in Brazil for BRL 2,299 or roughly Php31K.